Pull-on underwear are easy and convenient. Pull-on underwear for the elderly, usually the more mobile elderly, is popular because of how easy they are to use in public. One of the most popular types of incontinence products is pull-on underwear, especially for the elderly. Pull-on underwear for the elderly, usually the more mobile elderly, are popular because of how easy they are to use in public. Pull-on underwear, no matter what brand, is easy to pull up and they are easy to pull down, which makes using them in public simple. With how discreet the pull-on underwear is they make a great choice for the active elderly person in your life. There is no need for assistance when using the bathroom. 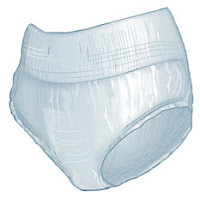 Another big benefit to using pull-on underwear for incontinence is that the pull-on underwear is very durable. Unlike briefs-style diapers the pull-on underwear is not held in place by tape or Velcro, this is why they are so easy to pull up and down. Instead, the pull-on underwear is held in place by elastic, the pull-on underwear is designed to fit to your body just like real underwear. While most people find the pull-on underwear to be a great choice for people who are active, the one drawback is that they are not as close fitting as other types of incontinence products, which makes them more prone to leaks. If you are going to be purchasing pull-on underwear for the elderly, one place that you can go for a wide selection of brands is The CareGiver Partnership. However, before you visit the site to select your products you will want to know some basic things to look for so you can choose the best pull-on underwear available. When choosing pull-on underwear the first thing you need to consider is the protection that the pull-on underwear provides. Some brands provide better protection than others because of how snugly they fit. When looking at the various brands you want to find some that guarantee a close fit, most will offer a feature like standing gathers, which ensures that the pull-on underwear fits close to your body, but are also comfortable. Something else to think about when considering the protection that they provide, is what level of protection the brand offers. Some offer protection for moderate to heavy, while others only offer moderate bladder control protection. The style is another important feature you need to look at when choosing pull-on underwear. Some brands of pull-on underwear are not very discreet, so others can tell that you are wearing pull-on underwear for incontinence protection. For some people, others knowing that they are having to wear pull-on underwear is embarrassing, so you want to choose a product that offers discreet protection, such as low rise pull-on underwear. To help make the product more discreet, you need to consider what the product is made from, if the material crinkles or makes other noises during normal activity it will draw attention to your loved one. You want to choose a product that that is made from a soft, cloth like material. Not only will the material not make any noise during normal activity, it will also make the product even more comfortable to wear. Size is another factor when choosing pull-on underwear. Most products are available in three different sizes, medium, large, and extra large. The size your loved one needs will depend on the size of their waist. For 34” to 44” waists, you will want to use a size medium, for a size large, your loved one will need to have a 44” to 58” waist, and for a 58” to 64” waist you will want to go with a size extra large. To get the right measurement you will want to measure around the hips and the waist, and then use the larger of the two measurements to determine the correct size.